This functionality is probably easy enough to do using Visio’s text editing toolbar buttons, but hey, this is a site for Visio Developers so I just had to customize something! Hope you enjoy Tom’s AV Components Visio shapes! 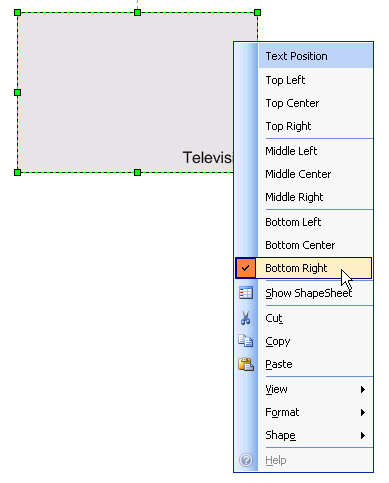 Below is a list of resources for shapes, stencils and drawings that relate to AV diagrams. Some products are for sale, others are free to download. 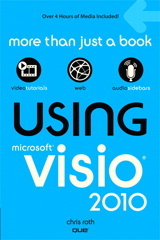 If you do a lot of AV work, and just love Visio, then you might be intersted in products from d-Tools. Check out the d-Tools product page and find out what they have to offer for Professional System Integrators. If you work with Bosch Security Systems, there are a bunch of free Visio stencils and shapesat this address. John Marshall’s Visio Download Sites has a huge list of Visio resources, some of which contain content relating to this post. NetZoom produces accurate representations of thousands of pieces of network equipment. They also appear to have sets of AV Equipment shapes. Have a look! Awesome, Chris, if you want to increase functionality put a connection point at the end of each patch cable. Also if you have some extra dev cycles create a label generator that asks on drop what the label of each component should be and where is should go like the back panel reposition text. Then add some functionality that links the label text to a database so you can add/edit labels easier. Then create functionality that tags each port with a Label, Signal type and Terminal type so you can produce detailed reports of what is hooked up to what. I am more of an IT Visio user than an AV user. I am after some free stencils for Plasma’s, Video conderencing etc. Thanks for the connectors for Visio. This will make life much easier. The only things I can see missing (and would like to see) are a VGA, DVI, and Serial port. This is great and I’m going to use this to lay my connection out for my new home. I just wish there was an HMDI (for display/receiver etc)and “game” type port (for my Wii). Great work and looking forward to seeing updates, when you have time. FYI – I have back plate images from my manuals etc that I will use to super impose these shapes on top of, then delete the back plat image for a clean look. 1) The RCA sockets are easily distorted. For instance, re-sizing the RCA AV shape will allow it to stretch the RCA sockets tall or wide. I can’t figure out how to fix the master in the stencil so that resizing will preserve aspect ratio. Any tips? 2) When I drag a shape from the stencil onto the drawing area, then from there back onto the stencil to make a copy of it, then try to edit that new copy of the shape, the stencil master editing window comes up blank. Can anyone explain why? Thanks for the hard work. I was trying to help an older gentleman connect his components and it helped me and him. Nice link, Lynn. Good ideas! Glad the shapes could help. These were submitted to me by a friend who just quickly whipped them together. One of these days we’ll have to update them. Like the article says, a colleague submitted these shapes, so I don’t know much about them, as I haven’t studied them. As to the blank stencil window, try zooming way out. Sometimes Visio drops masters “way off the page” when you make a new master. I don’t know why. And the page size is usually the same as the master, so “way off the master page” might not really be that far. For stretching groups, there is a setting inside of Format > Behavior > Repostion Only that is supposed to fix this, but it doesn’t seem to work every time. You could ungroup the shapes, resize just the outlines, then reposition the terminals, then group them all together again. Or go into the ShapeSheet and GUARD() the Width and Height formulas to fixed sizes instead of group-proportions. I have not worked on Visio for years and even then I was at beginner level. I am amazed at the capability Visio now has. I have been tasked with creating a company org chart. I have the 2007 version. What I have done thus far, is create a basic Excel spreadsheet and imported the information over to Visio (just a trial run with about 20 people). The org chart I need to create is for a company of 120 people. I need to be able to manipulate the information so that I can create mini-org charts from various depts and yet have one major org chart for all depts. I also need to show on the org chart how many people are allocated per certain departments/positions, how many positions are filled and how many positions need to be filled. What do you suggest is the best way to accomplish this? If there is an HDMI Shape can someone email it to me. Thanks nice stencil.